Finance Minister Morneau’s 2018 budget continued the string of punitive tax measures aimed at small business owners. While many commentators opined that it wasn’t “as bad as expected”, it still represents more taxation. With all of the rumoured changes, proposed changes and revised changes, many business owners are unsure how or if they have been affected. We offer you a summary of the changes and how your own tax plans may be affected. The changes announced in the summer of 2017, revised in the fall of 2017 and enacted with an effective date of January 1, 2018 effectively end the ability to share dividend income with adult family members unless you can fit into one of the new exemptions. Before these new measures, a common income-splitting technique involved paying a spouse or adult-child annual dividends from the business, often via a family trust. Because these family members are in a lower tax-bracket there would be a tax savings. Dividends had an advantage over paying family members a salary, because previously, dividends were considered a share of profits and did not need to be justified by working directly for the business in any capacity. For those family members age 25 and over there is another exemption for certain businesses: If the corporation is not a “professional corporation” or a “services corporation”, and the family member owns directly at least 10% of the votes and value of the operating business they can receive income splitting. The family member doesn’t meet this test if the shares are owned indirectly through a family trust or if ownership is in a Holding company which in turn owns the operating company. Professional Corporations are a subset of corporations that include doctors, dentists, lawyers, etc. The budget failed to define “services corporation”. One of the examples that came with the budget tells us that a restaurant is NOT a services corporation, but so far that’s all we know. If the family member meets one of these tests, the income is excluded from the new rules and there is also no need to justify the amount of the income. They are entitled to a “reasonable return” in the form of split income. “Reasonable” will be determined based on the facts of each situation. This reasonable return is further limited if the family member is between the ages of 18 and 24. Once you are finally able to scrape together a profit in your fledgling small business, there is a need to build retained earnings for a number of reasons: expansion, cyclicality of the business, emergencies, etc. and maybe even for retirement?! Instead of having this capital sit idle, many of us invest this money directly from our operating companies or from an associated holding company. This generates “Passive Income”. 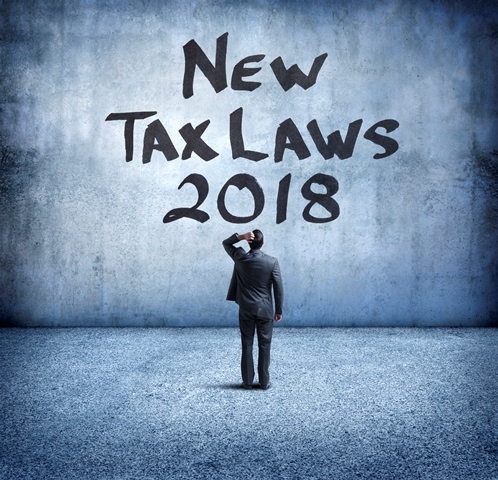 The new rules included in the 2018 budget create a consequence if you earn too much passive income – the gradual elimination of your small business limit. You will recall that small businesses pay a lower rate of tax on the first $500,000 of annual profit: 13.5% instead of 26.5% in Ontario. The new budget promises to lower the 13.5% to 12% in 2019. However, the new rules also proportionately eliminate your $500,000 small business limit once your passive income exceeds $50,000. You lose $5 of limit for every $1 that your passive income exceeds $50,000. 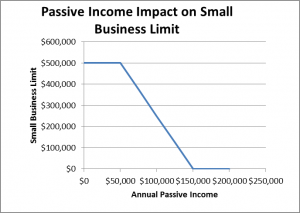 By this math, once you reach $150,000 of annual passive income, your small business limit is eliminated. For a company that makes $500,000 of active income and $150,000 of passive income, the additional tax payable is $72,500 as a result of these measures. Many of you might be thinking “No problem, my investments are all in my holding company, not my operating company….and since I don’t need the small business limit in my holding company…no problem right?” Not so fast…..the rules will apply the test to the total of all passive income received in all companies that are associated. It will then reduce the small business limit for the entire group of associated companies. The full definition of “associated companies” is lengthy….but for most of us the important point is whether the holding company and the operating company are controlled by the same individuals or group of individuals. If there are multiple shareholders in the operating company such that you own only 25%, for example and you own 100% of your holding company, they are not associated. But if you are the sole shareholder of both, your companies are associated. The reason this budget generated a “sigh of relief” is that the original proposals included a punitive tax of up to 73% on passive income. This didn’t happen. In the name of “simplicity” the budget instead attacks your small business limit. If you were splitting income and/or have passive income in your corporations while using the small business limit, you are about to pay a lot more tax. What actions can you take? Is income splitting still possible? Did a family member work more than an average of 20 hours per week in any 5 years in the company’s history? Do you own a non-service business for which your family member directly owns at least 10% of the votes and value? Perhaps your accountant and lawyer can examine a reorganization of your structure to make this possible. Where did the capital come from to start your business or grow your business? Can you demonstrate that a family member took risk with their own capital? Did you borrow against your home or did your family member co-sign for the loan? Did you invest joint savings in the business? Hire your family members. While the salary you pay them needs to be justified by the work they do….you are a better judge of a “reasonable salary” than CRA. Consider the type of passive income you generate. If you hold investments that generate capital gains…..that income is only realized when you actually sell the asset. A buy-and-hold strategy can minimize annual income. Shelter your passive income. Tax-exempt life insurance and Individual Pension Plans are two investment vehicles that don’t generate annual taxable income. The growth is sheltered and the taxable income is deferred. Get involved politically! One of the outgrowths of the limited-political-donation rules is that the business community has lost some of its voice. Businesses pay tax, but they can’t vote. Regardless of your political stripe, it’s crucial that we all make our candidates aware in both the upcoming provincial election and the federal election a year from now that the assault on small business must stop. Sign up to receive future articles for Business Owners.